Oakwoods is the most significant historic cemetery of Chicago's South Side. Established in 1854, but no burials took place until 1860. Many renowned figures are buried here, including Mayors Thompson and Washington, crime boss Big Jim Colosimo, Olympian Jesse Owens, civil rights activist Ida B. Wells, and physicist Enrico Fermi. Six thousand Confederate soldiers, prisoners of war, who died at Camp Douglas, are buried together beneath a towering monument, which is located just across the road from the Beth Hamedrosh Hagodol section. Oakwoods is located at 67th and Cottage Grove, just west of Hyde Park and the University of Chicago. Originally, the cemetery was beyond the city limits but conveniently close to railroad lines. Chicago annexed the area containing Oakwoods in 1890. In 1893, the World's Columbian Exposition was held only a few blocks north of Oakwoods, in what is now known as Jackson Park. The grounds include four small lakes. "Symphony Shores", around Symphony Lake, is the most prestigious section with three mayors. Along the southern wall is Jewish Oakwoods, which is not owned by the Oakwoods cemetery. It is separately managed and maintained by two local shuls. Fences separate the Jewish section from the rest of Oakwoods. Anshe Sholom B’nai Israel Congregation owns the Ohave Mariampole section. Congregation Beth Hamedrosh Hagodol Kesser Maariv Anshe Luknik owns the Beth Hamedrosh Hagodol section. These two sections are adjacently located. The third Jewish section is located within Oakwoods Cemetery management. This is the Congregation Rodfei Zedek section, located close to the two older Jewish sections. 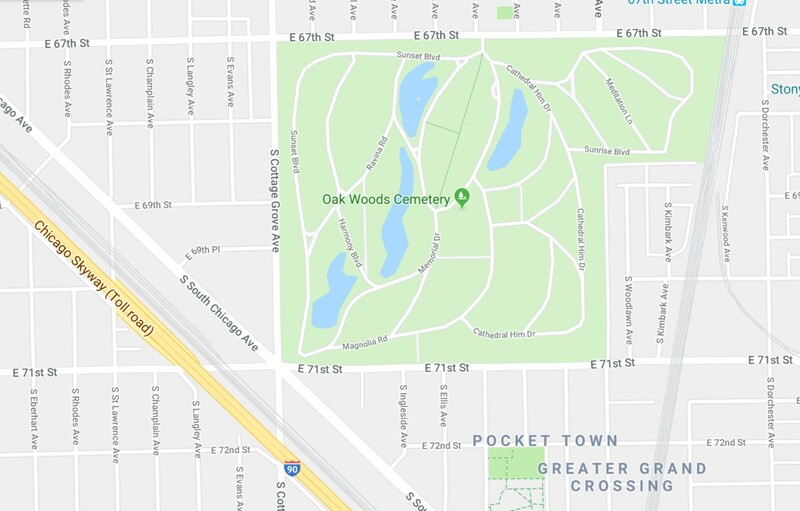 The two old Jewish sections are located at the south end of Oakwoods Cemetery, along 71st street. Ohave Mariampol has a sidewalk that runs north to south (vertical on the map) and divides that section into the East side and West side. Beth Hamedrosh Hagodol has two sidewalks that run east to west (horizonal on the map) dividing that section into south, central and north portions. The third Jewish section at Oakwoods is Beth Rodfei Zedek, located fairly close to Ohave Mariampole. This section is maintained by Oakwoods Cemetery. There are approximately 350 buried here. Not all Jewish burials took place within these three sections. One example is that of the infamous Chicago gangster, Jake Guzik. His family plot is in the general Oakwoods Cemetery.